Pratt Parkway has adopted a quarterly system of studying the Bible. Every quarter begins a new class and new topic. 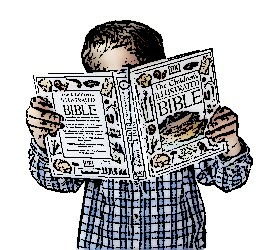 Our children from the age of 6 months to 17 years go through the entire Bible story every 2 1/2 years with their peers. By the time they get to be teens the great majority of our young people have a good background of Bible themes, characters, and know their Lord and Savior. We emphasize that the Bible school at the building is simply a tool for parents to use in training their own children in the nurture and admonition of the Lord (Ephesians 6:1-4). ARE YOU NEW TO THE BIBLE? If you or your children are beginning Bible students, don't worry, we offer beginner classes and personal guidance to help you learn the Bible. Copyright © 2013-2019. Pratt Parkway Christians. All Rights Reserved.